"But there are many Dominicans, in particular traditional Labourites, who continue to hold their noses and await salvation from anyone within the Labour Party who can cleanse the party that they love from the stench and scourge of Skerrit and his corrupt associates, like Astaphan. In private off-the-record conversations with several "Traditionals", as we will refer to Labourites in the mould of the founders of the party, we learned that they perceive Mr. Skerrit as something of a hybrid virus that was manufactured in the laboratories of the Freedom Party of Charles Savarin, and which came to infect the Party of Emmanuel Christopher Loblack, Phyllis Shand Alfrey and Edward Oliver Leblanc. They recognize that Mr. Skerrit's rapaciousness is antithetical to what the Labour Party stood for in the past and they remain wistful of the glory days long gone...The consensus among these traditional Labourites is that they love their party; they are Labourites to the end. However, they offer tacit support to the opposition. A minority indicated to us that they have not fully endeared themselves to the opposition United Workers Party for various reasons...and they view the Freedom Party as the reason why they are saddled with Skerrit, so they have propped themselves up into a corner biding their time, hoping that someone will emerge from within the ranks of their party that will pose a serious challenge to Mr. Skerrit." Little did I know that the solution would appear less that two months later. Yesterday we were privy to an extraordinary interview on Q95's Talk On The Block with a distinguished member of our diplomatic corps, Ambassador Crispin Gregoire. I do not know how many Labourites heard this interview but I am certain they all need to. In clear and certain terms, Amb. Gregoire laid out the case against the corruption that permeates the current incarnation of what he knew was once a great party, a party for the people, a party of the people. Dispelling any likely insinuation that he may no longer be a Labourite, Amb. Gregoire reaffirmed his roots in the party, clearly distinguishing himself as an individual in the mould of Leblanc, Rosie and Piero. He reminded Labourites that what masquerades as a Labour Party government today is nothing other than a collection of former members of the Young Freedom Movement. Although the interview is punctuated with several important segments, it is critical that we pay attention to Amb. 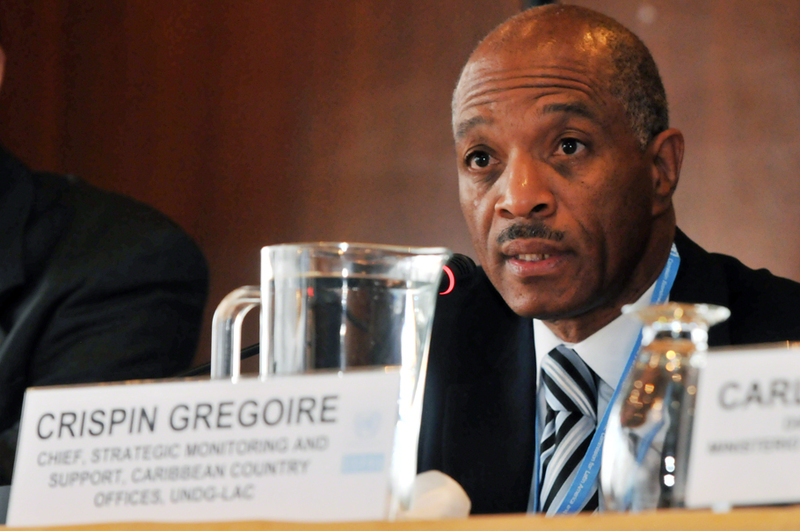 Gregoire's recollection of the sequence of events that led to Roosevelt Skerrit being made leader of the Labour Party and Prime Minister. Amb. Gregoire sheds light on the machinations of Skerrit and his enablers, all of who we can safely say have spat on the graves of Rosie and Piero ever since. We Dominicans must at some point come to grips with the fact that we need to cleanse ourselves and our country from this scourge. Traditional Labourites have a decision to make now; stick it out with the gang of thieves that have taken over your Party, or seek out a new leader for the times we live in. Undoubtedly the knives will come out for Amb. Gregoire from the usual suspects, but it is clear to me that traditional Labourites, like the ones interviewed for my earlier piece in May, now have a clear path to absolution. Amb. Gregoire comes to the table with clean hands. Among his numerous attributes, he is a statesman, experienced in government, well-versed in diplomacy, and possesses extensive contacts both locally and internationally. Amb. Gregoire has been in the trenches with our beloved leaders like Rosie and Piero, and he is not a pushover. The man is a djean Gwabay and a former Que Pasa. That says it all right there. It is now time for Labourites to expunge the likes of Roosevelt Skerrit and the entire cabal from the leadership of this country of ours. Never in the history of this island nation have we ever experienced the division we now live through. Dominica has never been so polarized. All of this came about at the hands of Roosevelt Skerrit. We need to rebuild our country. We need to love each other like we always did in the past. We need to create employment opportunities for all, especially our youth. All shall eat, not some shall eat all. Que Pasa Labourites? What are you going to do? To listen to Ambassador Gregoire's interview, click on this link below. Thanks for the pic,always heard the name but never seen the person.